SCA Tena Ultra Stretch Briefs MD/REG 32"-52" 36/bag is a top quality product for incontinence management carried by ADW Diabetes. 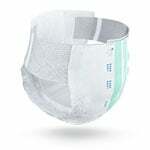 We now carry the SCA Tena Ultra Stretch Briefs MD/REG 32"-52" 36/bag manufactured by SCA - a leading manufacturer of incontinence management products and bladder control supplies. We offer great prices everyday on the quality brands by SCA, including Harmonie, Serenity, and Tena.